Who Needs SFG the Most? Haiti would certainly be right up there. The different times that I have been to Haiti I kept finding neighborhoods that were even poorer than I could imagine. But you know something? They all seemed happy. They wore brightly colored clothing. Kids were playing in the street and laughing. I couldn’t believe it. And they all wanted to garden and they could understand the principles of SFG right away. The problem was that they don’t own any land, they don’t have any tools and they don’t have any money. I could see where SFG was going to fit right into that picture. We built smaller boxes with scrap plywood bottoms, carried them into the house at night. They were filled with homemade compost and very few seeds were needed to get started. The nighttime movement was to protect the garden from anything that moved at night, including goats, bugs, neighbors, you name it. We tried something else with those that did have a house and we placed the gardens on the roof and built a small ladder out of scrap lumber we found at the dump. At night they just took the ladder down. Because everyone was hungry, they were willing to eat just about anything we could grow. So there weren’t any fussy eaters that say, “Oh, I don’t eat that!” This method was working in the city, out in the country and just about anywhere people were living. Surprisingly there was a lot of material to go in the compost pile. As you know, any plant material that was once living is suitable to be composted. Being in a tropical area, there is plenty of that in Haiti. Will this work? It’s a start. It’s better than standing in line for hours waiting for some humanitarian organization to ship in boxes of food and the only solution to that is to go hungry until the next shipment comes in. That’s why we believe in the parable of teaching a man to fish. We just change it a little bit and we teach the women how to garden. Why just the women? If you asked them, “Would you like to improve the nutrition of your children?” we know the answer right away. A man will say, “Well, what do I have to do?” so that’s not a receptive situation. I don’t have anything against men. Their role in life is to provide and protect. The mother’s role is to care – and they do all over the world. Here’s a picture of Pat and Connie Lahr working in Haiti. 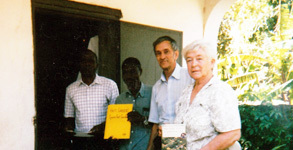 You can see in the picture that Connie is holding up the Original SFG book and one of their pupils is holding up the yellow teacher’s lesson plan. The next picture shows one of their students now becoming a teacher, all from that lesson plan. Pat and Connie (pictured above) have been doing humanitarian work in Haiti for many, many years and if you’d like to learn more about them – or support their mission – here’s a link to their website for lots of pictures and interesting information: Gardening Worldwide. There are many other countries I’ve been to that I would like to tell you about in future blogs, so come often and let me know what you think! In the past, I've donated seeds for Haiti. When I searched, I found there were some specific varieties for their relatively poor soil. Of course, using compost in smaller, movable containers would avoid that challenge. Congratulations on the work that's being done to find ways for women to feed their children! What a nice letter you have sent me. Thank you so much. We need a slogan or call to action like More Power to the Women of The World don’t you think? Or would we be picketed then? On the seed problem – many groups going overseas have contacted me and said, “How can we get all our seeds we are taking (turns out boxes and boxes weighting many many pounds) through customs and/or in our bags?” I was always astonished with the single row mentality and thinking the seed and garden industry has given us. You know, pour out an entire packet of seeds along a long single row and then when they sprout, go back and remove about 95% of the sprouts so as to leave one plant every 6 or 9 inches. Isn’t that dumb? Or would you call it stupid? BUT, THAT’S THE WAY WE HAVE ALWAYS DONE IT. You are exactly right as to how to remove the challenge of conventional gardening. Just think how much attention those plants will get if they are carried in and out every day in their little box container. We should all be so lucky. Best wishes to you Rebecca and thank you again for you warm letter. SFG makes more and more sense to all of us as we get older. Would love to get your opinion on a new indoor gardening concept that I call "Small Tray Gardening". Also thought you would be interested in my "4×4 SFG coldframe experiment"
The less work part of SFG makes sense to me as I get older. Thanks for your comment. I like everything you’re doing. Why can’t we bring our garden indoors for the winter? You’ve even come up with ways to protect it outside. As you probably know, most row gardeners are so tired and exhausted from weeding in the fall that they are ready to pack it in. They won’t even think about gardening until next spring when they get all excited again. One of our main educational efforts is to get people to go to three season gardening: Spring, Summer and Fall. Then we can go on to four season gardening: both outdoors and indoors, which you’re already doing. I applaud your efforts and would like to send some more people your way to show how easily it can be done. We are working right now with a LED light manufacturer and hoping to get something reasonably priced for the average square foot gardener. Concerning the ability to keep gardening as we get older, raising it up on a tabletop for either sit down or stand up gardening makes so much sense that people say, “Why didn’t I think of that? !” Of course you can’t do that with a row garden or even any of the other methods. You seem to have simplified indoor gardening one pot at a time – I like that. Keep up the good work and thanks again for your letter. Thank you for the encouraging words. I'm a big fan so they really mean a lot to me. Has anyone ever pointed out that Square Foot Gardening is "Open Source"? I plan to follow your "Open Source" example by placing Do-It-Yourself videos on YouTube. Thanks for your letter. While I agree that SFG is very adaptable, I would say that you should stick to the basic principles and if you make any adaptations to please explain them to your viewers on YouTube. Your adaptations may or may not agree with the basic principles that I have established and we don’t want people to think that you can do anything you want. A good example of that is sometimes on our forum we get a letter back saying, “I tried it and it doesn’t work. I did it just like you told me to in the book and it still didn’t work. You said there are no weeds in SFG and my garden is filled with them.” Upon inquiring, we found out he went to his local nursery who said, “You don’t have to buy all of those expensive ingredients. I’ve got a good potting soil that I can deliver a whole pickup truck load for only $45.” He agreed, he did it, he planted, and he had to weed. Rather than admit he didn’t follow the system to the letter, he blamed the system as the only out he could think of. In another situation, someone felt that our spacing could be improved and instead of 16 radishes they put in 25. What happened? They didn’t grow very well (too much competition) and they were small and spindly. He told his neighbors, “The system doesn’t work.” So if anyone is thinking of making rectangular boxes, let’s say 3’x9′ long, that’s perfectly alright as long as they divide it up with a permanent visible grid into 1’x1′ areas. That’s an acceptable adaptation to the space they have. We’re always looking for ways to improve the system. Sometimes that comes from people who have experimented and found in their area it would work better if… – for example it’s deeper than 6″ of Mel’s Mix and they’ve addded 8-12″ and because of the hot sun in the desert area, it doesn’t dry out as fast. Others have told us, “I don’t think you can grow anything in six inches (that was one of the experts),” so he advised everyone, even if they follow the SFG system and spacing, to start with 12″ of soil. He wasn’t in the desert and there was no need to do that other than his opinion. His opinion was because he was an “expert” and he’s always done it and dug down at least 12″ in his native soil. As it turns out, those that follow his advice started complaining that it cost too much to buy the soil mix and ingredients and of course it would. They had to buy twice as much as they needed to. So John, those are the kinds of things we look out for and if you could steer around those and let me know what type of adaptations you might come up with that would be a big help to us and everyone following the system. You are so right Mel about people changing your tried and true methods of square foot gardening. I just realized I am a culprit of this also! Duh! I have your original book, I know about grids. Did I follow that, no. I was so busy trying to keep cats out of my garden area and their poop out of my boxes and got sidetracked with planting lettuce and carrots. I did them in mini rows inside the squares, lol. I did have some concerns about their ability to sprout because some seeds were 3 years old, but still. I did follow the sfg spacing on the rest of my beds, but I am thinking when it came time for those tiny seeds, my brain went haywire. I better get my book back out and fix my perceptions. This was good to read about peoples adaptations when the work and figuring has already been done for us! I can see the dilemma with the cats, and that’s why we found that the chicken wire cage is almost foolproof. Once it’s made it will also last many years. i don’t mean anything disparaging about cats, because I am a cat lover, but how could they NOT like Mel’s Mix? It’s so soft and friable and easily moved about. Just think how satisfying the digging is for those little cat paws. You raised a few situations for me and that is how to keep people on the beaten path, if you will, and follow the rules. It’s kind of like giving a nature tour out in the woods and trying to keep everyone in line and on the path listening to what you’re describing as you take them through nature. There’s always a percentage that listen intently and stay close by, but the majority will meander, get off track and end up compromising. I’m glad you’ve returned to the fold and your experiences will help many others. Now if you can only keep your neighbors and family following the SFG method without deviating, we’ll consider you a perfect leader. Your examples of "improvements" that didn't work are a perfect lesson for me. Will think twice now before using the term "Open Source" since it invites tinkering. Just got back from a two week trip in Florida – hope this won’t be too late for your trip. My best advice would be for you to contact Pat and Connie Lehr at pclahr@yahoo.com or Gardening Worldwide. Pat and Connie have been going to Haiti for many years and have all kinds of projects underway there. They know the area, the people and the best way to help. Depending on where you will be, I’m sure you can make some plans with them. I wish we had time, we could send you some books to take but Pat and Connie also have material translated that they could email to you. Lorrie, we’re just starting a brand new grant program that may be of help to you on your trip. If anyone going overseas and teaching SFG sends us field reports and photographs that we can publish on our website that highlight our trip, we will send them a $100 gift certificate for anything from the SFG web store. Please take a lot of pictures and we can post your report when you get back on our website. Are you going with a group and can you give us any more info about your trip? If you can email us while you’re there we can post some of your pictures on a field report from Lorrie and that would encourage other people to do similar things like you are. My congratulations and safe journey. Thanks for the message. I would say pineridge and rosebud reservations need it most. They are the poorest counties in the united states of america and suffer the highest teen suicide rates in the world. The ground is so poor they cant even grow trees. My family is not lakota but that does not prevent me from seeing their despirate situation. Living in southern ohio on a ridgeline means the soil here is orange clay. I have been improving it for the past three years and am looking forward to using your bed design this spring. Last year i had two row gardens one was 40×60 the other 80x 40 due to the crazy weather we couldnt get in them to till or even use a hoe without sinking in mud above your ankles. It was a disaster. But i preserve foods profusely so i hope with your method i can spend more time canning and less time fighting cockel burs. Boy, you sure explained all of the reasons why single row gardening should be outlawed and made a crime to teach. All of the problems that you mentioned in your comment will be eliminated when you start your Square Foot Garden. Good luck and if I could give one simple piece of advice: start small and be sure to follow the directions from the ALL NEW SFG book. Regarding your comments on the counties and reservations, we have actually been contacted by reservations in the past who were looking for information on Square Foot Gardening. The response however, has been mixed. It seems that many of them simply want food delivered to their door, but the ones who have shown interest are very responsive. They want to learn a new way of gardening and have fresh, delicious vegetables at their back door. I wonder, what can we do to help the people on reservations? Do we have to go to the US Government and the Dept. Of Interior Indian Affairs and say, “Stop sending food. Stop teaching single row gardening.” The problem with that is, they are very content to keep doing it because that’s the way it has been done in the past and they see no need to change now. As with many of these problems it is really about getting to the people in charge and convincing them to think outside of the box. Actually, in this case it is about getting them to think inside the box. You have brought up some great points and I thank you for your comment. If there is anyone reading this post that lives on a reservation and would like help in learning how to help themselves, please get in touch with our nonprofit foundation.